In the activated sludge process, suspended growth microorganisms are employed. A typical activated sludge process consists of a pretreatment process (mainly screening and clarification), aeration tank (bioreactor), final sedimentation, and excess sludge treatment (anaerobic treatment and dewatering process). The final sedimentation separates microorganisms from the water solution. In order to enhance the performance result, most of the sludge from the sedimentation is recycled back to the aeration tank(s), while the remaining is sent to anaerobic sludge treatment. 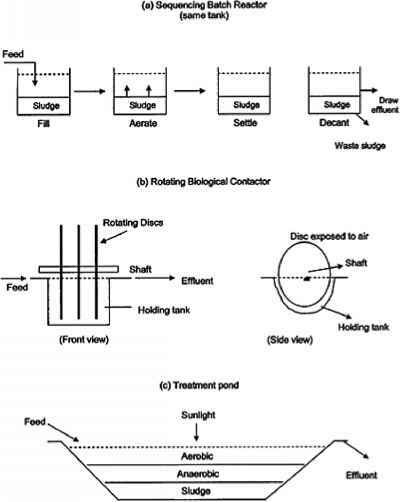 A recommended complete activated sludge process is given in Fig. 4. The activated sludge process can be a plug-flow reactor (PFR), completely stirred tank reactor (CSTR), or sequencing batch reactor (SBR). For a typical PFR, length-width ration should be above 10 to ensure the plug flow. 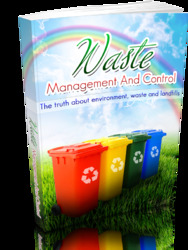 The CSTR has higher buffer capacity due to its nature of complete mixing, which is a critical benefit when treating toxic influent from industries. Compared to the CSTR, the PFR needs a smaller volume to gain the same quality of effluent. Most large activated sludge sewage treatment plants use a few CSTRs operated in series. Such configurations can have the advantages of both CSTR and PFR. The SBR is suitable for treating noncontinuous and small-flow wastewater. It can save space, because all five primary steps of fill, react, settle, draw, and idle are completed in one tank. Its operation is more complex than the CSTR and PFR; in most cases, auto operation is adopted. The performance of activated sludge processes is affected by influent characteristics, bioreactor configuration, and operational parameters. The influent characteristics are wastewater flow rate, organic concentration (BOD5 and COD), nutrient compositions (nitrogen and phosphorus), FOG, alkalinity, heavy metals, toxins, pH, and temperature. Configurations of the bioreactor include PFR, CSTR, SBR, membrane bioreactor (MBR), and so on. Operational parameters in the treatment are biomass concentration [mixed liquor volatile suspended solids concentration (MLVSS) and volatile suspended solids (VSS)], organic load, food to microorganisms (F/M), dissolved oxygen (DO), sludge retention time (SRT), hydraulic retention time (HRT), sludge return ratio, and surface hydraulic flow load. Among them, SRT and DO are the most important control parameters and can significantly affect the treatment results. A suitable SRT can be achieved by judicious sludge wasting from the final clarifier. The DO in the aeration tank should be maintained at a level slightly above 2 mg/L. The typical design parameters and operational results are listed in Table 6. 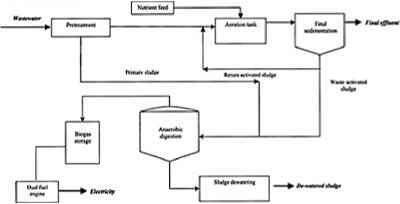 Figure 4 Process flow diagram of activated sludge treatment of bakery wastewater. Note: F/M, food to microorganisms ratio; MLSS, mixed liquid suspended solids; SRT, sludge retention time; HRT, hydraulic retention time; BOD5, five-day biochemical oxygen demand; VLR, volumetric loading rate. storage area and the coconut oil spray machines. Characteristics of influent and effluent as well as design parameters are given in Table 7. As shown, the company had favorable treatment results; the effluent was good enough for direct discharge to a nearby watercourse. Owing to the poor nutrient content in the influent, nutrient was fed directly into the aeration tank. Not all the added nitrogen was consumed in the treatment, thus the total Kjedahl nitrogen (TKN) concentration in the effluent was higher than that in the influent. The high HRT in Table 7 shows that the process was not in fact economical. The bakery wastewater treatment can be more costeffective if the waste is first treated by an anaerobic process and then an aerobic process.